Death To Fitness: Six Pack Abs! How to Get Them and Why They Are Terrible For You. Part 1.5. Killing the fitness monster, one person at a time. Information to help you reach your goals and shift the disposition of the human race from fat asses to bad asses. Six Pack Abs! How to Get Them and Why They Are Terrible For You. Part 1.5. Flex your abs. Right now, wherever you are, whatever you are doing, flex your abs as hard as you can. What happened? What did your upper body do? Did it cave over a litte? What about your lower body? Did your lower back get a little looser and your pelvis tilt up in the front slightly? If you answered yes to any of those questions, then you have some sort of dysfunction going on in your abs. It's not your fault. Everyone told you to do sit-ups. To do crunches. You read that article about some actress that does 15 trillion crunches a second. Or you are doing P90X or the 300 workout or some other stupid thing with some juiced out maniac/CGI muscle-guy-cartoon on the cover. Before I drop some anatomy on you, lets go to common sense first. Think of the position you are in when you do a crunch or a sit-up or any conventional ab exercise. Your are on the floor basically forcing yourself into a contorted mess that is genetically programmed in us to be a sign of weakness. These examples took me 10 seconds to think up. 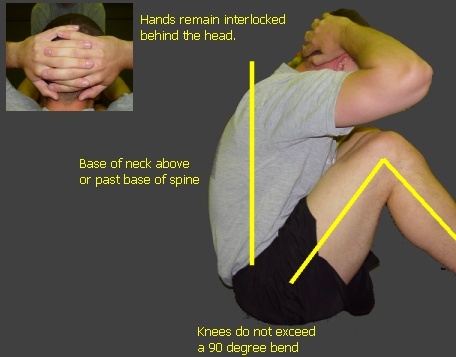 The point is, spend most of your training in these positions and you are just getting ready to fail miserably in a situation where something terrible is happening to you. It's sprint, kill, eat. Not fall down, curl up, and get murdered. P90X put 50lbs on his deadlift... it's also going to put him in a wheelchair. In all fairness, I have no idea if this kid did P90X. I am sure he does plenty of crunches... on a bosu ball... for max reps... 8 times a day. Ok, technically, there is back extension at the beginning of the exercise. The reason this is awesome is because, when your abs are working during this movement, the spine is neutral and the abs are braced, not flexed. Imagine at the complete extension of the movement, that I drive my right knee forwards... it would look a whole lot like someone sprinting as fast as they could. Obliques (internal/external and some of the glute complex to some extent): Those pesky love handles. People work these to death and nothing ever changes. Maybe because they are being worked the wrong way. 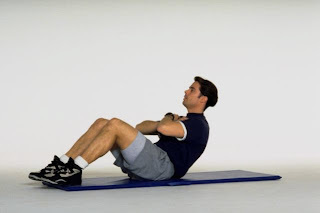 The obliques function to counteract the pull of gravity on the body. Wow... think about that for a second. For anyone trying to get stronger/run faster/jump higher/relieve back pain, the obliques sound awfully important don't they? These muscles were meant to be very strong. If you think they weren't, think about how much weight you could hold and perform a side-bend exercise with. 50lbs? 100lbs? 200lbs? Maybe more? These need to be trained like a midget on steroids: hard and heavy. The same thing can be done with a barbell, heavy dumbbells, dogs, entire sides of beef that you will eat all of immediately after you finish the exercises, just about anything. The key is to keep it heavy and do sets until it feels like someone injected concrete mix into your sides and lit your forearms on fire. Now the MOST important aspect of your core. The one nobody trains. Not the best form on the GMs but I did it and I am now stronger for it. Key to these exercises: 1. Go Heavy- progressively work to heavier and heavier weights. If your form is good (neutral spine) and your programming is smart then it is IMPOSSIBLE to hurt yourself. 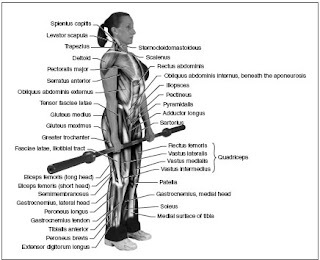 2- Again, keep a neutral spine, don't be lazy, be strong. How do you put it all together? How about the deadlift. Yes. This entire post was leading up to how awesome deadlifting is for you. Want to know why people really do traditional ab exercises for countless reps over and over and over? Because they are easy. Anything that is easy is not good for you. EVER. Easy makes you fat. Easy makes you weak. The above mentioned exercises are very stressful and will make it hard for you to walk without crying for several days after you do them. You will eventually get used to doing these various acts of badassery but only after you've gotten all of the sadassery out of your system. Now, re-do the test from the beginning of the post. Contract your abs again but, not into flexion. Contract your abs and brace while keeping the arch in your back. There. That was a step in the right direction. Just some things to think about and consider in your own training to reach your own goals. Hopefully, this rant opened someones eyes and caused you to think outside the box a little bit. I'll probably get one more part out of this topic dealing with dieting. Not dieting like eating less or eating crap like "fruit" . More like dieting while eating like a meat-fueled, human muscle museum with exhibits on the history of being a badass. Between now and then, be sure to pick up something heavy. Sprint. Kill. Eat... and don't do sit-ups anymore. I have been working out for a couple months, and I have noticed I have been lacking on my core, your blog has really been a big help. listening to some Meshuggah!? ;D good workout tunes! Wow great to see the videos. Really it's seems to be very useful to me. Thanks for sharing ! Hope you will share some useful tips for How To Get Six Pack Abs. Waiting for the same! Hey PowerMike can you give me some health tips How to get six pack abs in just 1 month.